[PDF] A Cultural History of Translation in Early Modern Japan | Free eBooks Download - EBOOKEE! Description: The translation of texts has played a formative role in Japan's history of cultural exchange as well as the development of literature, and indigenous legal and religious systems. This is the first book of its kind, however, to offer a comprehensive survey of the role of translation in Japan during the Tokugawa period, 1600-1868. 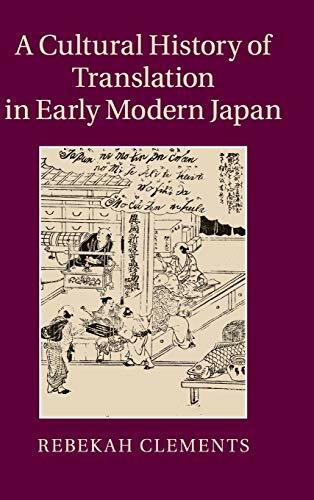 By examining a wide range of translations into Japanese from Chinese, Dutch and other European texts, as well as the translation of classical Japanese into the vernacular, Rebekah Clements reveals the circles of intellectual and political exchange that existed in early modern Japan, arguing that, contrary to popular belief, Japan's 'translation' culture did not begin in the Meiji period. Examining the 'crisis translation' of military texts in response to international threats to security in the nineteenth century, Clements also offers fresh insights into the overthrow of the Tokugawa shogunate in 1868. No comments for "[PDF] A Cultural History of Translation in Early Modern Japan".